We architect have to keep an eye on many aspects of the construction industry, but one of my favourite subject is solar cells and not just out of a whim, I sincerely believe that many of the current world problem will be solved if we all elected to install solar cells in our homes, offices or businesses. 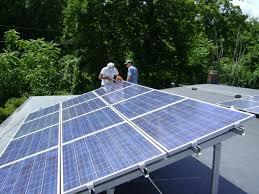 Solar energy is an endless source of renewable, clean, abundant energy that can be found almost throughout the planet. The good use that can be made of it by producing electricity provides great benefits for homes, office buildings and the industry. Despite being intermittent, as it depends on weather conditions and day-night cycles, electricity generated by the sun can be harnessed throughout the day and stored in batteries. Did you know that solar energy offers both economic benefits and environmental benefits? Environmental benefits are as important or more than economic benefits, as they affect the world directly and indirectly. The generation of electrical energy through conventional sources, coal or natural gas, contaminates a lot and causes the search for other alternatives less harmful to the environment. It highlights among all, that photovoltaic energy is inexhaustible and endless. At the moment, society is concerned about the environment and air pollution, caused mainly by conventional thermal power plants, car exhausts but also by the contamination of water from the rivers due to the discharge of toxic particles from the by-products of these plants and other sources of contamination. Therefore, more and more experts are involved in the search for alternatives. Of all of them it emphasizes photovoltaic, because it is inexhaustible, is available in the whole planet and is profitable. Solar cells, also called photovoltaic (PV) cells by scientists, convert sunlight directly into electricity. 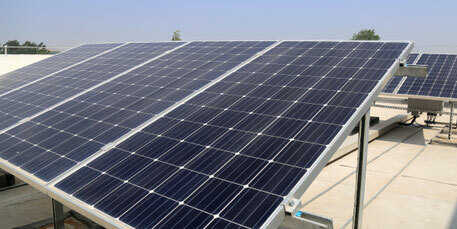 PV gets its name from the process of converting light (photons) to electricity (voltage), which is called the PV effect. The PV effect was discovered in 1954, when scientists at Bell Telephone discovered that silicon (an element found in sand) created an electric charge when exposed to sunlight. Soon solar cells were being used to power space satellites and smaller items like calculators and watches. Record-low costs enabled by decline in module and inverter prices. The installed cost of solar power fell to record lows in the first quarter of 2017 because of the continuing decline in photovoltaic (PV) module, inverter prices, higher module efficiency, and lower labour costs, according to an analysis by the U.S. Department of Energy’s (DOE) National Renewable Energy Laboratory (NREL). While utility-scale solar costs have declined nearly 30 percent, residential- and commercial-scale solar system prices have lagged behind at 6 percent and 15 percent reductions, respectively, according to a new report, “The U.S. Solar Photovoltaic System Cost Benchmark: Q1 2017PDF,” by NREL by Ran Fu, David Feldman, Robert Margolis, Michael Woodhouse, and Kristen Ardani. The report shows that the level cost of electricity (LCOE) benchmarks without subsidies for the first quarter of 2017 fell to between 12.9 and 16.7 cents per kilowatt-hour (kWh) for residential systems, 9.2-12.0 cents a kWh for commercial systems, 5.0-6.6 cents a kWh for utility-scale fixed-tilt systems, and 4.4-6.1 cents a kWh for utility-scale one-axis tracking systems. The report estimates that the total installed system cost, which is one of the primary inputs used to compute LCOE, has declined to $2.80 per direct current watts (Wdc) for residential systems, $1.85 Wdc for commercial, $1.03 Wdc for fixed-tilt utility-scale systems, and $1.11 Wdc for one-axis tracking utility-scale systems. The rapid system capital cost decline of solar PV systems, driven by lower module prices and higher market competition this year, demonstrates the continuing economic competitiveness of solar PV in today’s energy investment portfolio. These results suggest that the DOE’s SunShot Initiative, which was launched in 2011 to make solar cost-competitive with other forms of energy, has met its 2020 cost target for utility-scale solar systems three years early. The industry is more than 85 percent of the way toward achieving the 2020 commercial-scale and residential-scale solar cost targets. The report highlights the importance of reducing the non-hardware, or “soft,” costs of solar, as soft cost categories are demonstrated in the link shown below. As the PV module price has reached a new low level, the proportion from soft costs—such as labour and overhead costs—has grown. In the first quarter of 2017, soft costs accounted for 68 percent of residential system costs, 59 percent for a commercial system, and 41 percent of a utility-scale system. Approximately 13.7 gigawatts (GW) of new PV systems were installed in the U.S. last year, with the largest share coming from 10.2 GW in the utility-scale sector. Nearly 45 GW of solar is installed in the U.S., accounting for about 1 percent of the nation’s electricity supply.